Israeli military companies such as Elbit Systems appear invincible, yet Israel’s arms industry is more vulnerable than it seems. Al-Shabaka guest author Maren Mantovani and Policy Advisor Jamal Juma’ examine both national and global trends and identify avenues for human rights activists to pursue to hold Israel accountable under international law. Israel’s biggest military companies last year rang alarm bells over a decline in international contracts, citing smaller budgets, more competition, and less desire for Israeli-made products as among the reasons. Is this an indicator that Israel’s arms industry might not be as invincible as it seems? What led arms deals with Israeli companies to fall through? What was the role of the Palestinian-led movement for Boycott, Divestment and Sanctions (BDS), which has called for military sanctions as part of its campaign to promote human rights? In this Al-Shabaka policy brief, Maren Mantovani and Jamal Juma analyze some of the trends facing Israel’s military industrial complex with a particular focus on the campaign against Elbit Systems. The brief examines the tough times facing the industry, the myth of Israeli technological superiority, the industry’s local and global shifts, and the alliances emerging to reverse the militarization and securitization of societies. Based on this analysis, they draw valuable lessons and identify avenues for the global Palestine solidarity movement to pursue. For years, Palestinians and their supporters – global figures such as Desmond Tutu, Adolfo Peres Esquivel, Naomi Klein, and Noam Chomsky – have called for an immediate and comprehensive military embargo against Israel to hold it accountable for its violations of Palestinian human rights. Tens of thousands of people have signed petitions and activists have demonstrated against companies tied to the Israeli military. For the last decade, activists have run a campaign against Elbit Systems, one of Israel’s largest military companies. The effort ranges from governmental lobbying to blockading Elbit subsidiaries in such countries as Australia, the United Kingdom (UK), and Brazil. A dozen financial institutions, including almost all major Scandinavian pension funds, are no longer investing in Elbit Systems. In addition, and especially in the aftermath of major Israeli attacks, some European governments have taken restrictive measures including temporary freezes of arms deals and denials of arms export licenses. For example, theUK revoked five arms export licenses after the 2009-10 Gaza massacre, Spain froze arms sales over the 2014 Gaza massacre, and during the period of its center-left government (2005-13) Norway consistently refused arms export licenses to Israel and even stopped a German shipbuilder from testing Israel-bound submarines in its waters. South Africa has de facto ceased its military relations with Israel. Yet until recently it seemed these actions would remain symbolic in their impact: The Israeli military industry appeared as invincible as the weapons it produced. This changed in October last year, when Israel’s biggest military companies called a meeting with the government to discuss how to tackle the decrease in military exports, which they expected at the time to fall from $7.5 billion in 2012 to around $4.5 billion in 2015. The companies pointed out that Israel's defense industry profit margin is about 4.5%-5.5%, compared with 8%-9% in the defense industry globally.They cited “smaller budgets, more competition, less desire for Israeli-made products, and the growing demands to transfer know-how and work abroad” as the reasons. Global military expenditure stayed almost unchanged in recent years and indeed rose 1% in 2015. The revenue from one of Israel’s key military export products – drones – was even expected to nearly double from $6.4 billion to $11.5 billion between 2014 and 2024. While the reasons cited by the Israeli military industry seem to be an accurate description of trends in the global military trade, the drop in Israeli exports cannot be explained simply due to a lack of demand for weapons. True, the Israeli military industry managed to ensure exports of over $5 billion in 2015 – a slight recovery from the previous year – and global political developments may bode well for the sector in the near future. Yet the military industrial complex is facing changes in the dynamics of its trade and propaganda. The erosion of the “Made in Israel” brand even in the defense and security sectors, to which the efforts of the BDS movement have contributed, is fertile ground in which human rights advocates can effect change. When questioned recently about the impact of BDS on Elbit Systems’ operations, CEO Bezhalel Machlis admitted: “I’m not saying it’s not a threat, but I think that altogether we can handle it.” Human rights advocates now face the challenge of increasing the capacity of the BDS movement so that it pressures the Israeli war economy to the extent that it moves from being a threat to a definitive impediment. Almost a decade into the campaign to stop investments, contracts, and other cooperation with Elbit Systems, some lessons can be drawn about the mixture of market forces, government structures, and activism that contributes to change. This section focuses on the latest losses Elbit suffered in France and in Brazil: Two governments that have had almost opposite perspectives on Palestine and the legitimacy of the BDS movement. France’s decision against Elbit’s bid in its latest drone tender at the beginning of 2016 was an unexpected piece of bad news for the company. The now discarded Watchkeeper drone is based on Elbit’s Hermes 450 drone, which is being used in the massacres against Gaza. The Watchkeeper is being built in the UK by a joint venture between Elbit and a UK company. A sustained civil society campaign in France demanded the exclusion of the Watchkeeper from the tender on the grounds of Elbit’s involvement in Israeli war crimes, while in the UK activists have protested the Watchkeeper production site. The French company Segem, which eventually won the contract, downplayed the fact that its drones also include Elbit technology. Instead, it celebrated its “national” technology and production. Only a few years ago, the “Made in Israel” tag would have counted as a plus for a drone. Today, the rising trend to ensure the growth of national military industries and a maximum of technology transfer has been a central element in eroding the appeal of Israeli military technology across the globe. This also ultimately contributes to one of the objectives of Palestine human rights campaigners – reducing the profits Israel gains from its war machine – and enables their advocacy to achieve results. It is unclear to what extent pressure from the Palestine solidarity movement influenced the decision of the French government, which has been developing laws against BDS even more draconian than those in Israel. However, in April Israel reported that in 2015 the French government rejected another deal, in this case for surveillance technology. Fox News quoted a “well-placed Israeli counter-terror specialist:” “French authorities liked it, but the official came back and said there was a higher-level instruction not to buy Israeli technology.” If the report is not propaganda aiming to push forward other contracts, it indicates an unexpected reluctance within French government circles to enter into deals with Israel. In Brazil, Elbit’s local subsidiary AEL Sistemas has seen an end to a decade during which its revenues grew exponentially, with a share in every major Brazilian defense project. The country was one of the fifth biggest importers of Israeli weapons between 2009 and 2014 and one of the most important clients for Elbit drones. However, in December 2014 the company lost its first strategic project: The government of Rio Grande do Sul, in the south of Brazil, annulled a Memorandum of Understanding with AEL Sistemas for the development of a technological park for the construction of military satellites. The deal was opposed by a sustained civil society campaign for a military embargo. That campaign was based on solidarity with the Palestinian people and the need to end Israeli impunity, but it also went further: It unmasked AEL Sistemas’ attempt to pass as a Brazilian company and exposed it as an Israeli subsidiary, underlining the fact that Brazilian tax money would be channeled to Israel. Further, it proved that technology transfer would effectively flow from Brazil’s universities to an Israeli company. Ultimately, the government cited budget constraints and its commitment to cooperation with the Palestinian community and movements as reasons to end the project. This was a clear win for the BDS movement. In January 2016, Elbit Systems had to abandon its drone research and development (R&D) project in Brazil, which hadlaunched in 2011 with great fanfare. The Ministry of Defense, headed by a member of the pro-Palestinian Communist Party of Brazil until the coup against the government in May of this year, refused funds to implement it. The ministry’s reticence was undoubtedly influenced by the political positioning of the Brazilian government. A high ranking Brazilian defense official had sparked an argument in the media when he warned that the diplomatic rift provoked by Brazil’s refusal to accept a settler leader as Israel’s ambassador could delay the execution of military contracts between the two countries. This concern was picked up by other figures such as the former defense minister, Celso Amorim, who argued that now is the "time to diversify our suppliers" and reduce excessive dependency on Israeli technology. Avionics technology in most airplanes, Brazil’s drones arsenal, surveillance technology in the border control systems, technology in Brazil’s tanks, and the communication system of the Brazilian sea forces are all provided either by Elbit Systems or by Israeli Aerospace Industries and their subsidiaries. This effectively results in a loss of national sovereignty and independence, the core principles to which defense establishments are committed. A 2015 reportfrom The Marker, Israel’s most important financial newspaper, rightly highlighted that “political reasons” have led to a de facto freeze of military transactions with Brazil – a development that is particularly painful for Elbit Systems. 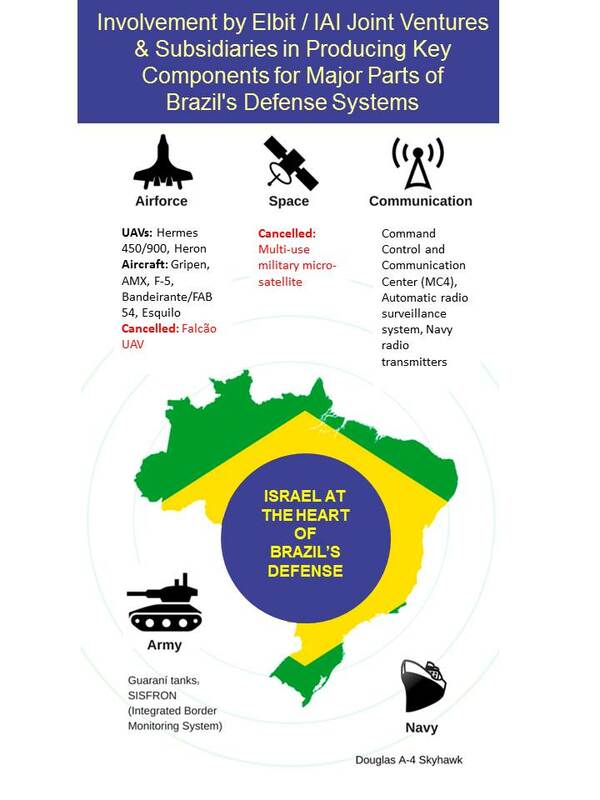 Without a doubt, the hard times Elbit Systems has been facing in Brazil are to a large extent due to the souring of relations between Brazil and Israel during the last years of the government led by the Workers’ Party, which ruled the country from 2003 until May 2016. This in turn is partly the result of the growing influence of the BDS movement in the country and acceptance of its arguments within parts of the Workers’ Party. The awareness raising campaigns that seek to dismantle “Brand Israel” emphasize that Israeli weapons are “field tested” on Palestinians and alert the public to the fact that tax money is spent to sustain Israeli military companies. These strategies have penetrated even into the defense establishment. However, Palestinian human rights advocates will now need to identify new strategies given the coup against the elected government. The failure of the Watchkeeper to win the French drones contract shows that even in contexts quite hostile to the demands for a military embargo, the enchantment with Israeli military technology can fade and other interests can prevail. It is crucial to understand what in a government apparently antagonistic to pro-Palestine attitudes is creating rifts between the Israeli and French military sectors and how to best capitalize on it. The current tender for another drones deal, in which Elbit Systems is again among the bidders, makes this effort urgent. What these case studies show is that investing time and energy into understanding the dynamics within the defense and homeland security sectors is fundamental for developing effective BDS activism. At this stage, as the benefit of military cooperation with Israel becomes more and more questionable, Palestine solidarity activists can use this gained knowledge to deliver, or find allies who can deliver, arguments that target the interests of national decision makers. The net result could shrink markets for the Israeli military industry. The Israeli military industry is a key element in the country’s economy. It employs some 50,000 people, supports another 50,000 suppliers, and accounts for 13% of all industrial exports. The 600 companies that constitute the sector rely heavily on external markets: 80% of Israeli military production is destined for sale abroad. Israel’s capacity to wage wars, maintain its military industrial complex, and compete in the global market depends on its reputation as a country with cutting edge and “battle proven” weaponry. Over the last few years, public opinion has become increasingly aware that the label of “field tested” stands for weapons developed during massacres and war crimes against the Palestinian and Arab people. Worldwide protests such as the occupation of Elbit factories in the UK and Australia, die-ins in many places, petitions, and in depth reports and media coverage have all contributed to this growing awareness. To counter the growing protests from civil society, those defending military relations with Israel argue that military cooperation with and sales from Israel are in a country’s national interests. However, the idea that Israeli weapons are inevitably the best choice from a technological perspective and that adopting a military embargo would mean compromising “national security” is another myth to be dismantled. The Israeli military industry today attempts to penetrate new markets by promoting itself as a leader in cyber-security. However, the long record of spying scandals involving Israeli software and data processing companies has put Israel’s capacity to “secure” anything into question. Indeed, there are many reports that Israeli companies use contracts abroad to channel sensitive information to Israeli intelligence agencies. For example Amdocs, Israel’s biggest software company, has been repeatedly accused of espionage, including in the US. In addition, there is a revolving door between Israel's top spy unit – military intelligence Unit 8200 – and the country's high-tech and cyber sector. "It's almost impossible to find a technology company in Israel without people from 8200," said Yair Cohen, a former brigadier general who once commanded Unit 8200 and today heads the intelligence cyber department of Elbit Systems. The process is quite simple: Israel allows former Unit 8200 personnel to use the technology to build their own start-ups (sometimes making immense profits) and in turn gains access to information across the globe, effectively installing a Trojan Horse within the institutions seeking cyber-security. However, the transfer of Israeli technology comes with strings attached for those that want to make policy choices that are not in the interest of Israel and the US. During the most recent period of India’s National Congress administration from 2004-14, which officially maintained a pro-Palestinian position, diplomats informally complained that tight military relations with Israel made it difficult for the government to take effective steps in solidarity with the Palestinian people. The recent debate in Brazil about measures the defense sector could take to retaliate against the country’s firm stand against settlements is another example. China was one of Israel’s biggest military partnersuntil 2005, when the US asked Israel to cut all military relations. As a result, even the military equipment China had already bought was grounded and given no maintenance. In the pre-state period and the early years of statehood, the Israeli military industrial base’s energies were focused on equipping a military that would conquer Palestine and expel its native population. In later years, retired members of the military created a multitude of small “security” companies to cash in on their know-how in repression. Israel outsources the dirtiest of its international military relations to these companies, which allows it to deny involvement. At the same time, the core military industries, Israeli Aerospace Industries (IAI), Rafael Advanced Defense Systems, and Israeli Military Industries (IMI), remained state-owned to ensure direct control. Only Elbit Systems has been able to thrive as a major private Israeli military company at the same level of the state companies. Over time, the military industrial sector became relatively independent. It still serves the government in maintaining its regime and in its foreign policy needs, but it has developed its own interests. The alarm bell rung by the Israeli military industry in October 2015 was an effort to pressure the Israeli state and to ensure that it and taxpayers would guarantee that low exports and falling profits be offset by government intervention. The Israeli government handed out lucrative contracts at the end of the year. In addition, budget allocations for the military industry, including grants for marketing, were distributed generously. However, the latest news is that the deal is again on track. This is bound to deepen the dynamic whereby the profits of now privatized military companies are their own while the burden of losses is carried by the state and citizens. Global trends in the military sector are another element producing changes within the Israeli military industry. The growing demand in the global arms sector to produce within the client country, including offset agreements and technology transfer and training, has led Israeli military companies such as Elbit Systems to pursue a strategy of global acquisitions. Instead of strengthening the national defense industry of client countries, this strategy creates a denationalization effect by outsourcing the industry to Israel. Elbit Systems is today present under many names and in many sectors around the world. One of Elbit’s latest acquisitions is Nice Systems, a data processing software company with a presence in over 150 countries that has private businesses as well as local public institutions as its clients. While this strategy aims to expand Elbit Systems’ profits, it potentially enables the global BDS movement to target Elbit’s interests not only at the level of federal ministries of defense but closer to home. Furthermore, Elbit Systems’ acquisitions strategy means that it enters into debt in order to buy other companies and create a conglomerate. In order to sustain such a policy it needs to ensure a continuous cash flow. This is a substantial risk, as a breakdown in investments and contracts or decline in trust and negative perception in the investment environment could lead to a solvency crisis. And, if Elbit Systems wants to transfer potential global losses to the state, can Israel afford it? In looking at the Israeli military industry’s prospects, it is important to highlight that the industry’s overall sales rose to over $5 billion by the end of 2015. This was due to a number of new year-end contracts, though sales were still significantly lower than previous years. However, Israeli military corporations have several major export opportunities coming up that will need the attention of the Palestine solidarity movement. Israel’s current negotiations with the US for a new 10-year military aid deal is expected to grant Israel significantly more than the current $3.1 billion a year. Given the upcoming US presidential elections and the nominees of the two major parties, the movement will have its work cut out for it. Still, the deal has the potential to challenge the Israeli military industrial complex. Included in the discussions is a US desire to cut the percentage of funds Israel is allowed to spend on its own military industry. Reuven Ben-Shalom, the former head of the North America branch of the Israeli military’s strategic planning division,defines such a prospect as “devastating to Israeli military industries.” The president of Israel’s Manufacturers Association, Shraga Brosh, also warned that if the US desire becomes a reality, “[d]ozens of production lines and even whole defense plants will shut down, thousands of workers will be fired, and the State of Israel will lose its security independence.” Thus an increase in military aid might actually end up a blow to the Israeli military industry, with the mid-term effect of Israeli companies relocating production or increasing joint ventures with the US to guarantee continued access to US military aid. As for Europe, sales to the region more than doubled last year to $1.63 billion from $724 million in 2014. European cooperation with Israel is poised to continue to rise as the EU further tightens borders to counter rising immigration, with bombings and shootings in European cities used to justify increased spending on the militarization and surveillance of society. Latin America, though it saw a downturn of sales to $577 million in 2015, might also offer new markets due to the ebbing tide of progressive governments in the region, particularly in Brazil, where the coup government has immediately pushed for closer ties with Israel. In Argentina, the newly elected right-wing government started its termoffering stronger military and security cooperation to Israel. The Asia-Pacific region’s imports slightly declined to $2.3 billion in 2015 compared to some $3 billion in 2014. However, the overall trend over the last decade shows a dramatic rise of military exports to this region. Asia accounts for 29% of Elbit Systems’ revenue, and there is scope for more given that Israel recently approved a special budget for Elbit Systems to market itself in China. Moreover, Elbit Systems has just formed a joint venture with Indian companies to sell more drones to the country, and Rafael Advanced Defense Systems signed a cooperation agreementworth $10 billion with Indian giant Reliance Defense in March this year. India’s government is also reportedly close to signing a $3 billion defense deal with Israel and is considering cooperation with Israel on the construction of a fence in Kashmir. Even more worrying than Israel’s spread in these markets are the reports that some Gulf states are vying to buy the Iron Dome anti-missile system. The call for a comprehensive military embargo on Israel is rooted not only in the Palestinian call to end Israel’s impunity and the world’s complicity with its apartheid regime. It is also part of a global struggle against wars and repression and against the militarization and securitization of society. There is increasing awareness of the ways in which Israeli military and “homeland security” exports are contributing to these practices through new technologies and methodologies developed in the process of military occupation, apartheid, and the ethnic cleansing of the Palestinian people. In turn, militarization and securitization help to sustain Israel’s military industry and its policies against Palestinians. In parallel to Israel’s growing role in this militarization, movements across the globe are making common cause with the BDS movement against repression and discrimination by military and police forces. The campaign against the Israeli “homeland security” company International Security and Defense Systems (ISDS) is an important example. Former Mossad agents founded ISDS in 1982. Investigative journalists as well as former members of military juntas report that ISDS trained death squads in Guatemala, El Salvador, Honduras, and Nicaragua and was implicated in coups and attempted coups in Honduras and Venezuela. Similar connections have been made between the Palestine solidarity movement and Black activists in the US, who in 2015 issued a statement of solidarity endorsed by over 1,000 black activists and intellectuals noting that “Israel’s widespread use of detention and imprisonment against Palestinians evokes the mass incarceration of Black people in the US, including the political imprisonment of our own revolutionaries” and calling for joint struggle against the security company G4S. Moreover, in August 2016 the Black Lives Matter movement endorsed the BDS movement. The US-Mexico border wall is another site of joint struggle between Palestine solidarity activists and the indigenous people affected by the implementation of Israeli methodologies and technologies on their land, in which Elbit Systems plays a key role. The campaign in the EU to stop funding to Elbit Systems and other Israeli military companies touches on a larger question of concern to every European citizen. With an €80 billion budget (approximately $88 billion at end-2015 exchange rates), the current EU research and development funding cycle Horizon 2020 is among the world’s biggest funding schemes. It redistributes taxpayer money mainly to corporate and academic institutions developing research at the service of big business, including in cooperation with Israeli military companies. The research projects with Israeli military companies often develop dual-use technology (technology for both military and civilian use) in clear violation of EU regulations and contribute to the militarization and securitization of European societies. Most Europeans, if they knew how their money was being used, would likely agree that the EU harms not only Palestinians but also its own citizens by spending on wars that create new refugees and on technologies that control, racially profile, and oppress Europeans instead of supporting their needs. This policy brief has sought to provide an overview of Israel’s military industrial complex and to identify entry points that could reduce the industry’s profits and eventually lead to an arms embargo until Palestinian rights are achieved. There is no doubt that this is a major undertaking: The military industrial complex involves powerful corporations, slick propaganda and marketing, and global defense establishments that are often far from the discourse and reach of solidarity activists. Yet it is not only an ethical necessity for countries to end military relations with Israel until it upholds international law; it is also a campaign that can be won. Indeed, based on experience to date, and in light of the above analysis, there are several entry points for activists to consider. At the most basic level, public education and outreach are essential. Most people intuitively understand that their governments should not maintain military relations with an occupying power that launches regular military assaults against the besieged Gaza Strip and other neighboring countries as well as commits incursions, raids, home demolitions, and other human rights violations against the occupied West Bank and East Jerusalem – particularly as these acts violate not only their own moral code but also their countries’ laws and international law. The numbers of human rights advocates working for boycotts and divestment is growing; it is only a matter of time before the numbers advocating sanctions, and particularly military sanctions, grow to form a critical mass. Solidarity with Palestine by communities also impacted by militarization and securitization has a long history, especially in Latin America, where Israel and its private agents have for decades supported and trained death squads and dictatorships. Strengthened cooperation between Black Americans, Latinos, and indigenous peoples in the US, paired with the exponential militarization of European metropoles, mean that a broad and organized network of campaigners has the potential to develop in the West as well. In the case of the EU, a groundswell of public opinion could be used to back technical arguments to challenge Horizon 2020 funding to Israeli military – and other entities – complicit in the occupation. In their campaigns, activists should also draw on the evidence that Israeli military technology is neither as effective nor as problem-free as its public relations purport. The major issues with Israeli drone production and the questions surrounding the Iron Dome are just two examples. Even more compelling is the fact that Israel is undermining country capacity to manage its own defense, siphoning countries’ national industrial capacity to Israel and using its security systems to spy on country clients, effectively resulting in their loss of national sovereignty and independence. Elbit Systems, big as it is, is particularly vulnerable to activist action. It is the only Israeli private military company of this size and hence is more vulnerable to crises, risks of financial speculation, and economic restructuring. Elbit Systems is highly indebted and needs to ensure a continuous cash flow to service that debt. Its ever more global presence makes it easier for activists in different countries to take on Elbit or its subsidiaries. In addition, the growing dependence of the military industry on the Israeli state budget to rescue it also makes it vulnerable, while increasing the vulnerability of the state. Activists should also learn from the lessons of experience: Israel always positions itself to take advantage when new governments come to power or new national policies are passed. Activists too should position themselves by developing contingency plans to deal with changes in governments. It is key to secure, where possible, commitments or legislation from friendly governments against military trade with Israel and to take advantage of instances in which hostile governments enact policies that contradict Israeli interests. Leveraging internal dynamics in such instances is an essential element for success. If military sanctions against Israel are to be established, Palestinian civil society and activists will need to work hard to pressure the Palestine Liberation Organization (PLO) and the Palestinian National Authority (PNA) to use their diplomatic contacts and whatever powers of persuasion they may have, both with individual states and at the UN. In particular, they should ensure that the PLO/PNA uses every means possible to prevent and reverse arms deals between the Gulf states and Israel. There is no way to calculate when the tide will turn. But popular struggles against repression, war, and apartheid, reinforced by a growing negative perception of the Israeli military industrial complex, could strike at the core of an industry that both sustains and thrives on Israeli aggression. The myth of Israeli military technology is slowly crumbling, and a more privatized Israeli military industry is as exposed to risks in the global markets as other corporations. The call for military sanctions may start to bite even before governments are ready to implement a full fledged embargo. The authors are part of the Stop the Wall campaign. However, the UK still tested the drone in its overseas territory of Ascension. Bishara Bahbah, “Israel’s Military Relationship with Ecuador and Argentina,” Journal of Palestine Studies, 15, 2 (Winter 1986): 88-89. See also Hugo Harvey Parada, Chile – Israel Relations 1973-1990 (Santiago: RIL editores, 2011). Shir Hever, “Privatising Israel's Arms Industry,” Middle East Eye, January 27, 2016, http://www.middleeasteye.net/columns/privatising-israels-arms-industry-9... . The article provides an excellent analysis of the IMI privatization process and Elbit Systems’ role. For example, after the attack on the Brussels Airport in March 2016, Belgium allocated an additional €400 millionfor an intelligence agency. In April the EU passed a controversial law on the long-term storage of airline passenger information, which will cost roughly €500 million. Elbit Systems is well placed to take a substantial share, as the EU has for years funded it to develop the technology to implement such a policy. In addition,documentation recently released by the Transnational Institute and Stop Wapenhandel shows the profits Israeli companies are reaping from the EU’s migration policies. Because these companies have extensive experience with such elements as maintaining the Wall and developing drone technology (used mainly in the massacres against Gaza), they have much to offer EU anti-migration efforts. The deal is still in place, contrary to reports that it was cancelled. The campaign against ISDS’ presence in Rio de Janeiro continues.